The Slide 7271-HD70 features 7-inch display, dual-SIM support and 2MP rear camera. 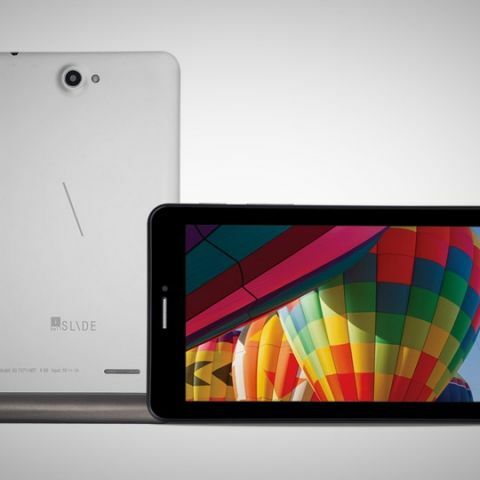 iBall has added another tablet to its popular Slide series. The new iBall Slide 7271-HD70 boasts of dual-SIM support with dual standby and 3G connectivity option. The tablet is priced at Rs. 8,299. The iBall Slide 7271-HD70 features a 7-inch display with 1024 x 600 pixels resolution. The tablet runs Android 4.2 Jelly Bean and is powered by a 1.3 GHz dual-core Cortex A7 processor along with 1GB of RAM. It has 2MP rear and VGA front camera. The tablet comes with 8GB of built-in storage, along with memory card slot for additional space. Connectivity options include 3G, Wi-Fi and Bluetooth. The tablet is powered by a 3,000 mAh battery. The new iBall Slide 7271-HD70 seems to be an upgraded version of the Slide 3G17 tablet, which featured similar set of specifications but with lesser 512MB of RAM and 4GB of built-in storage. The Slide 3G17 is available at Rs. 7,649.